February 7, 2016 February 8, 2016 / Steve M.
With thanks to Camillemm, who brought this matter to my attention when I accidentally, misspelled the name several times in my first post on the the mysterious Montorg??il. Now whilst accepting that apparently no one knows who he/she?is, and at risk of stating the obvious, somebody does , if the signed editions produced by Editions Bel-Rose in 1970 are genuine then somebody presumably presented the books to the author/illustrator, so that they could sign them, and also negotiate matters around copyright and earnings from the books. This also places a certain credibility with the Bel-Rose editions, in that if they were really in contact with the person using the pseudonym, they were also aware of how to spell the name, and he/she was happy to sign the books with the same spelling. I have checked all of my Editions Bel-Rose, titles in both the French and German editions, and they all use the spelling above, and although the legibility of the signature differs they are generally clear enough to confirm that the e precedes the u in the spelling of the name and confirms the printed version as correct. Is this a mistake, or a scam of some kind, surely if the author, chooses to hide their identity, then they choose both the name and its spelling. This leaves me with a serious question, why does the spelling on auction records and later editions change? In-4 (266 x 212 mm). 60 pages de texte calligraphié à l’encre noire avec initiales en rouge, 48 dessins dont 2 à double page et 46 à pleine page, à la mine de plomb, certains avec rehauts aux crayons de couleurs, sur vélin d’Arches cartonné. Détail des 5 récits: 1) Dans la Maison des Amazones, Seize images d’étranges plaisirs: titre calligraphié à l’encre rouge et noire, 16pp. de texte avec initiale rouge et 16 dessins ; 2) L’Accusation: titre au crayon rehaussé de couleur, 13pp. de texte et 5 dessins ; 3) Équivalences: titre à la mine de plomb, 7 dessins dont un à double page ; 4) De la pénétration psychologique en matière d’éducation: titre au crayon rehaussé de couleur, 16pp. de texte et 9 dessins ; 5) L’Invertie convertie: titre au crayon rehaussé de couleur, 15pp. de texte et 11 dessins dont un à double page. Reliure signée Honegger en maroquin mauve, premier plat et dos ornés de mosaïques géométriques de maroquin rouge, noir, brun et bleu marine ainsi que de trois disques de box chair ; dos lisse, titre à la chinoise, décor à l’identique, doublures et gardes de crêpe noir à résille, tête dorée, non rogné (dos un peu passé). EXCEPTIONNEL ENSEMBLE MANUSCRIT avec 48 superbes dessins érotiques au fini parfait de ce maître de l’illustration sado-masochiste, Bernard Montorgueil, dont toute l’oeuvre célèbre la femme dominatrice dressant les hommes. Dans les présents dessins, l’auteur de Dressage et d’Une Brune piquante, transforme de jeunes hommes tendres et graciles en objets de luxure pour des femmes vêtues d’ahurissantes combinaisons fétichistes. La plus grande discrétion entoure Bernard Montorgueil. Son oeuvre commença à circuler sous le manteau dans les années cinquante, mais elle semble plutôt dater de l’entre deux guerres. On connaît au moins quatre séries de dessins accompagnés de textes calligraphiés. Bernard Montorgueil se situe au tout premier rang des illustrateurs érotiques du XXe siècle. The worrying theme of giving provenance of works from the 1930’s apparently without supporting evidence continues, and I will try to pursue at a later date. The matter of the name and its spelling is my main concern at the moment. As despite the fact that the Bel-Rose editions have a variant spelling and are signed, and that at least in the latter (date wise) of the two auctions these editions are referenced, then how come they missed the spelling of the name? 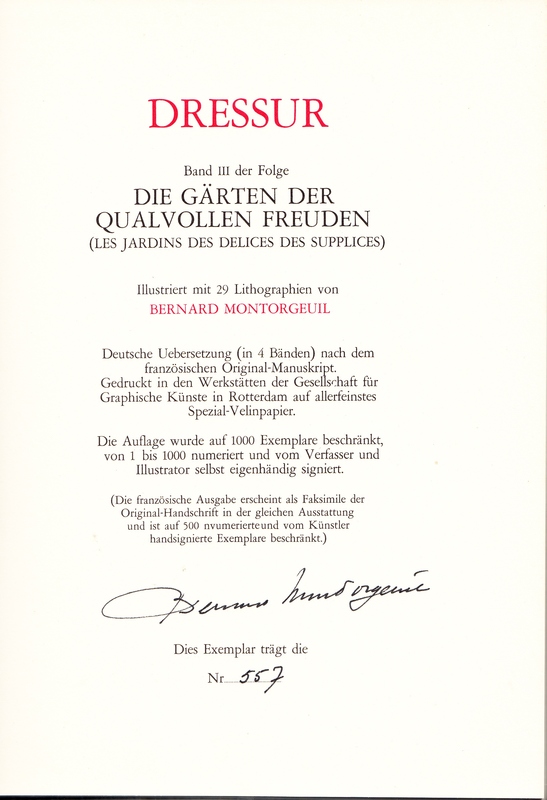 Certainly it is unsurprising that the manuscript and illustrations purchased at the 2006 auction which ultimately provide the material for the 3 éditions Astarté volumes carry the same spelling as the auction listing, the spelling that continues throughout the books despite surprisingly, reproducing an image, as I have done of a signed Editions Bel-Rose limitations page, without referring to the different spelling. I will continue to pursue this interesting puzzle and anyone who would like to contribute would be most welcome. It could be, that I am missing something, but I cannot see any reference to anything “signed” in either of the auction descriptions. So are the Bel-Rose editions the real thing, are the two lots by the same hand, and why did no one pick up on the anomaly? What started as a query on an Englishman’s spelling of an unusual , French name, now makes me wonder why so many French speakers are having the same problems with what to them should be second nature. For French people, “Montorgueil” is the logical orthographic way to spell the name. It clearly derives from ORGUEIL (pride) (Montorgueil would be Pride mount). MONTORGEUIL sounds wrong. There is no words (I cannot find any) using GEUIL and it’s not “pretty” when pronouncing it. More impressive: if you look at “Montorgeuil” in french Google, you won’t find any entry. Nobody in France is named Montorgeuil 🙂 So the artist would not have any father 🙂 But it could be a pseudonym (psuedonym ? as you type it). Hi and thanks again for being my spell checker. My comments were not a critique of you or the French language, and I thank you for your explanation. Regardless of the grammatical laws, the spelling on all the Bel-Rose editions is indisputably the ugly sounding version =”eu”, the point I am trying to make is that this is not a mistake, it is deliberate and I believe intended to mislead, why I am not sure. But hope to find out. No problem, I did not perceive your searches as a language critic. It’s a very motivated search as you show a signature – false or original – that needs some explanations. I just love a good mystery, it seems even when the books are not clandestine there is something to unravel, be it the author the artist or the publisher. Interestingly the Montorgeuil spelling comes up as a Catalan word. I assume it is a name as it does not translate into anything else. Hi again it appears there is a Rue Montorgeuil, 1st arr, in Paris, unless that is another spelling mistake?